Relief workers unload food aid flown in by helicopter for people affected by the 7.5 magnitude earthquake which struck Papua New Guinea in February 2018. Children’s lives are in danger. With limited access to basic necessities, families are struggling to survive in crowded shelters, or to rebuild homes and food gardens. Last week alone, UNICEF delivered 23 metric tons of relief supplies to the nation, including tents and tarpaulins, water purification tablets, hygiene kits, blankets and learning kits. UNICEF staff unload emergency supplies in Port Moresby, Papua New Guinea for earthquake response efforts. UNICEF is working with the Government and partners to ensure humanitarian supplies are distributed to affected communities as quickly as possible. UN Population Fund (UNFPA), World Health Organization (WHO) and UN Women are also on the ground. The island nation, on a volatile seismic fault system, has been experiencing a spark of activity, with the latest strike by a 6.6 magnitude quake several hours ago, according media reports. 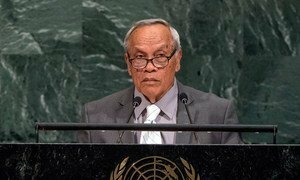 Leaders from Pacific island nations addressing the United Nations General Assembly today urged Governments to implement the Paris Agreement, and contribute to fighting climate change and supporting sustainable development efforts.